Barring an unexpected development, 54-year-old Perry Prince will celebrate his Nov. 17 birthday in the same place he's spent the last five weeks. CINCINNATI -- When the elevator at the Overlook at Clifton Apartments failed in late September, management told fifth floor resident Perry Prince it would be functional again in early October. Halloween passed. November began. Prince continued to wait. Barring an unexpected development, the 54-year-old wheelchair user will celebrate his Nov. 17 birthday in the same place he's spent the last five weeks. "It's beyond frustrating," he said Friday night. "It's beyond anger. It's sad. It's hopelessness." Representatives of Gaslight Properties, the company that owns the building, said Friday they were sympathetic to Prince's situation and attempting to complete the repair as fast as possible. The repair involves the replacement of a large cylinder at the base of the elevator, according to property manager Gidget McMeekin. "It takes 3 to 4 weeks just to build the part, and another three weeks to install it," she said. That could mean Prince remains stranded indoors, dependent on others to bring him groceries and other necessities, until early December. Prince shattered a neck vertebra while preparing for the 1995 Pan-American Games and lost all function below his shoulders. Although he eventually regained feeling and control in his arms, his ability to walk never returned. His case in an extreme one, but he believes it's not unique. 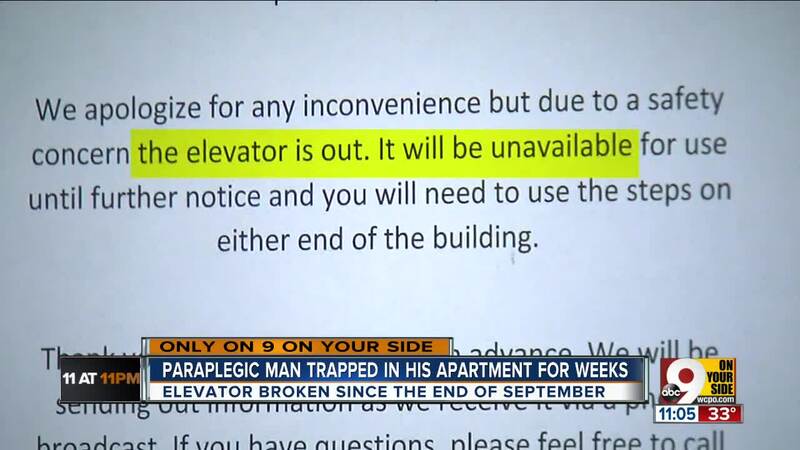 There are other residents of the building who live with limited mobility and for whom a broken elevator is at best an inconvenience. At worst, it's what it's become for Prince: An impassible obstacle capable of keeping a person with disabilities trapped on a single floor of a single building for months. "I've come to the conclusion that it's time to stand up for people who can't stand up or speak for themselves and I'm willing to be their voice and say 'Enough is enough, and it's time to get things done.'" Although representatives of Gaslight Properties said they were willing to help however they could, it was unclear Friday night whether they would be able to help Prince relocate until the elevator is restored.